Our lives are as fragile as the wings of a butterfly, and make little impression on the larger world. Flying creatures in the Jurassic Era made a larger impression in fossilized rocks. Does the New Year encourage us to pause and reflect? Perhaps, but this is all the reflecting I intend to do. I am busy putting stuff away. After I dismantled the holiday decorations, using brown cardboard boxes for storage, I no longer knew which box contained what or where anything was. Thus, one of my goals in the New Year is to bring order to the holiday stash with “see-through” containers for all these goodies. When I began decorating this past season, I noticed I had too many of one thing and not enough of another: too few extension cords, too many strings of colored lights and ornaments. I found enough ornaments to decorate a grove of small trees. Time to purge I think. Oh yes, I know some of you are better organized, but I am only beginning to become a truly organized person. I began my undertaking with my skeins of yarn which now mostly occupy a plastic container under a coffee table which sits under a card table next to my chair. I have a drawer full too, where once hundreds of discarded DVDs lived. One of the container product reviewers warned, “You will like these boxes so much you will want to buy more. Be wary as you will end up collecting boxes and not get around to your projects.” So true…my partly done Afghan is waiting for me next to my chair. Too bad, I have been diverted, reading about Lincoln and General Grant who reminds me of Patton. David’s shop was filled with boxes until yesterday. True, I saved them for recycling, but they can always go in the blue bin after I remove their contents and fill new plastic containers. When I found mice turds in one of the older cardboard boxes, I knew it was time to make a change. My goodness, they even made a nest in the stove top, which should give you a clue as to how often I turn on the stove. David and I have been fighting the mice for 30 years. 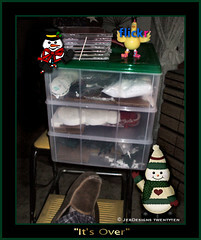 No Nutcracker he, but I have organized my pantry and cupboards, owing to help from Amelia, one of my granddaughters. Shelves filled with mostly organized plastic containers holding corn meal, whole wheat flour and such fill my cabinets. Meanwhile, regarding cooking, I have all sorts of good intentions, and you know where they lead. I bought containers for our cereal and outdoor bird food. I have large rolling containers for the parrot pellets and seed mix. We empty the bird dishes every night and David sweeps the floor and takes the trash bag to the bin. Still the mice come. Our old house has many entryways. Ines, my cleaner says at her house they catch the mice and turn them loose in the local park. They always come back she says. I called Mario the terminator, and he says as long as I feed the birds, the mice will come. Perhaps I am becoming container mad, but they are so nice in my war against mice. 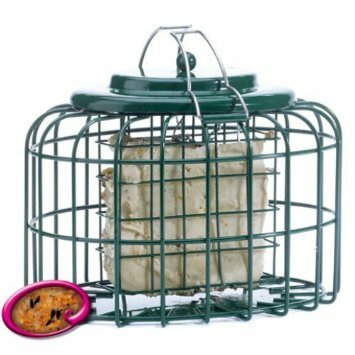 They will never be able to eat anything’, says David when he sees my new squirrel-proof suet feeder with a cage wrapped around a cage. I would show you a photo, but my on again, off again software is being recalcitrant…so I have used a photo from Zemanta. And below I finally got the darn thing to upload. 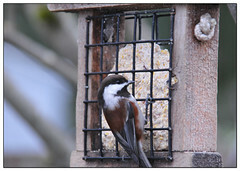 Within the hour, the little Chickadee is hopping around inside the caged feeder and merrily eating. The larger sparrows cannot spoil his fun. Yesterday, finches in their winter camouflage were fighting for a place at the feeder. I told David he can put the shipping box that held the new suet feeder into the recycle bin. This entry was posted in Birds, Contemplation, Elder Blogger, Memories, Retirement Living, Urban Spaces by SchmidleysScribblins. Bookmark the permalink. I am a container fan for foodstuffs in the pantry and for craft work in my den. Otherwise I would never know where to find anything. The small bird population has gone down in my garden over the past few years, I blame the neighbourhood cats who seem to have made MY garden their play space. No matter what I do, I am unable to deter the cats. I LOVE containers! I don’t need more, but for some reason I get drawn to them in container stores. Being able to see through is great however, I’ve found that the clear plastic in Hawaii seem to deteriorate faster. Then again, maybe it’s my imagination. Once my cats moved in, the mice in the dome fled for their lives. Cats confinded to the indooors hunt whatever they can find . Plus I think the squirrels and birds on the porch teasing them puts them in a murderous mood.I also have two fridges one not plugged in, for dry goods.I use glass jars for some of my art/craft projects and small bits of stuff I know I will “need”. Happy New Year to everyone. Yes, I need a cat. Unfortunately, cats also like to chase birds. Bad enough with the dogs. They also like to chase birds. I had a problem with field mice coming into my garage so last fall I got rid of all cardboard boxes and containers and put everything in plastic bins. Now there are droppings on the plastic bins but everything inside is safe. Yes, the mice are still around and frustrated. It’s much easier to be hyper organized when you live alone ! I find that I throw away about half of all the things I was sure I needed in the past. It’s very liberating. Love the wording you put “war against mice”. In my house, the mice here know how to touch our soft spot (‘they’ tell the little mice to come out and spy on us), I guess that is why they keep coming. I guess I should be doing this container thing too! Can you also remove the snowflakes. They cause havoc here with blinking etc. Thanks. Now I will go down to my new year chore….redoing my pantry in clear plastic bins. LOL Do we think alike. I am rereading “All the Presidents Men” and am having great fun today. Snowflakes stop automatically on Jan 4. 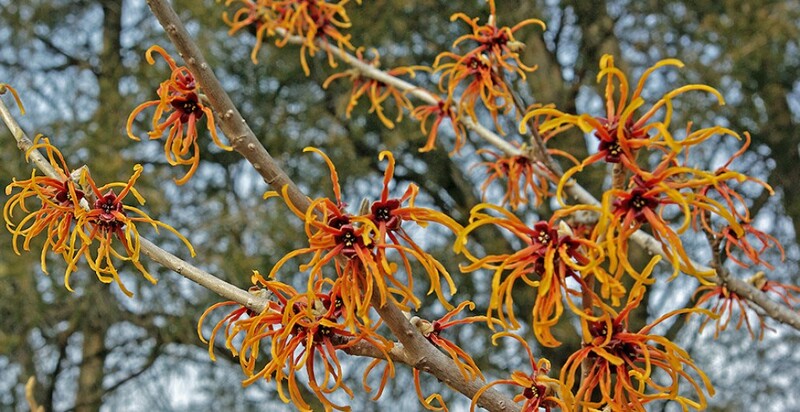 Unfortunately, winter continues until March 21. Wow, a cage within a cage. Who would have thought that would solve the bird feeding problem? Excellent invention! As for plastic storage bins, they do serve a purpose and it’s easy to spot what is in them. We have 2 refrigerators, one in the kitchen and the other one in the living room next to the sofa. I store the flour, cereal, and other food that might harbor bugs in the fridge. That frees up counter space for meal preparation. I definitely prefer having 2 fridges than having boxes, packages, and bins on my limited counter space. I do have far too many containers, of all sizes. I love them, especially clear solid containers. They are worth it as they really help me organise my life. Good luck! Happy New Year to you. Thanks Janet. I can see why you would need them given all your art projects.